The first botanical was Cacao, the natural medicine and potentiator. Deep, resonant, and sensual, Cacao not only evokes the promise of something delicious in the offing, but also soothing and satisfyingly grounding. A true mystical healer. Cacao is said to open the heart chakra and assist with integrating and healing our entire being, gross to subtle. Cacao’s exotic sister plant, Vanilla, with its boundless capacity for joy and inspiration, then came forward. Earthy with some spice, Vanilla harmonizes gloriously with Cacao and just about everything else she encounters. Her ability to be powerfully alluring and intoxicating, while at the same time soft and sweet with childlike innocence, fully embodies the mystic sensual feminine. Divine Rose, purveyor of balance and harmony, is considered to be the highest vibration essential oil. She is immediately calming and supportive of the heart and emotional well being. Richly delicate and subtle, she also has staying power, strength, and good boundaries. Rose evokes the higher self and allows love to flow through all aspects of our being and those we encounter. The rich, grounding, synergistic blend of cacao, vanilla, and rose provide the stability and tenacity to confidently root into our essential nature and, from there, generate abundance. The last botanical to call itself in was the bright essence of organic Peppermint, who takes us by the hand and allows us to shine that nature out infinitely. Equally soothing and stimulating, she brings focus and clarity, harnessing our positive qualities and giving us to the courage to confidently share our gifts. 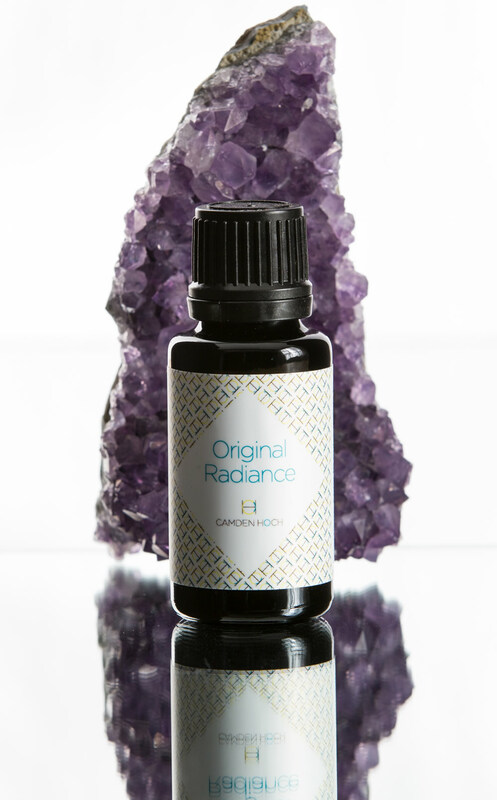 With this Original Radiance blend, Camden and I intend that each and every time you open the bottle, the plant medicine supports you in bringing forth your truest self and unique gifts. That you feel a sense of ecstatic groundedness, of expansive joy and unshakable belief in yourself and your world. Of unbounded love, your own particular variety, that only you can share. Apply to pulse points on wrists and neck to ground and release your soul’s radiance of joy, your truest self & your unique gifts of unbounded love. Ingredients: Organic Olive Oil, Kukui Nut Oil. Essential oils of Cacao Absolute, Vanilla CO2, Rose Absolute, Peppermint, Vitamin E. For External Use Only. 15 ml. Formulated exclusively for Camden Hoch by VenusandVetiver.com.